WinZip, the popular file compression and management utility for desktops, has finally made its way to the iOS. 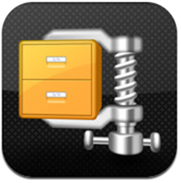 An official WinZip app for iPhone, iPod touch and iPad has just been released by WinZip Computing LLC which can now be downloaded for free from the App Store. The universal app is optimized for both iPhone and iPad with an easy-to-use interface for quickly opening and managing compressed zip files. WinZip, the leader of file compression for over 20 years and the creators of WinZip the world’s # 1 zip utility for file compression, file sharing, file encryption and data backup.